I really like the tea Matcha and I eat it willingly even when it is used as an ingredient in recipes. this site that specializes in the sale of Tea Matcha particular Japanese tea. tiramisu with green tea a delight! In a bowl, mix the egg yolks, sugar, milk and Matcha previously sifted. In another bowl prepare meringue, beating egg whites with a mixer. In another bowl prepare meringue, beating egg whites. 1. Pre-heat oven to 200º. 2. Coat the mold with butter (this time we used “Easy Bake” instead of butter). 3. In a bowl, combine graham cracker crumbs and melted butter. 4. Put 3. into the mold. 5. Heat the cream cheese in the microwave for about 40 seconds. 6. In a bowl, mix cream cheese and suggar. 7. Add one egg and beat well. 8. Add another egg and beat well. 9. 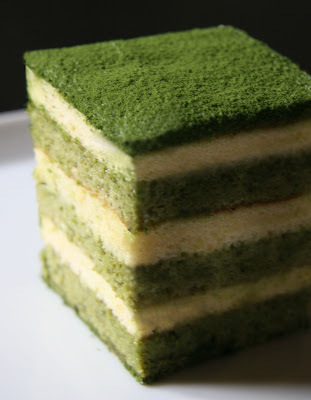 Add flour and Matcha and mix well. 10. Add cream and mix well. 11. Pour the dough into the mold. 12. Adjust the oven temperature to 170º and cook for about 40 minutes.